The wave quality, ball-busting commitment and samurai warrior skills displayed throughout the rounds of the Striped Horse Challenge has been nothing short of phenomenal. We’re gunning it headlong towards the finishing line, and in two short months, we’ll be crowning one lucky shredder with a golden ticket to Hawaii and 50 grand in cash. So, let’s take a look at a blow by blow, round by round account of the SHC to date. June saw some of the best waves of the winter and the riders submissions did not disappoint. We received 18 epic and high definition entries! Yuslaaik ous, pace yourselves next time. The West Coast, The Donkey, Durban Town and Country, and even Dungeons awoke for the first real month of winter, and the crew was on it. It’s with thanks to the arrival of groomed swells, long periods, longer barrels and some honest charging that resulted in a cracker opening to the SHC18. As he’s well known for doing, Jordy Smith emerged head and shoulders above the pack, booking himself a place in the finals showdown with a long, thick, snake oil tube ride in between the piers. Ding ding ding, first round goes to the big man. Also in the ring but for a good beating was Kommetjie’s Paris Basson who single-handedly plowed his way down the steep face of a significant and grumpy looking Dungeons. Well done sirs. July was more of the same with a bundle of entries billowing out of all corners of the country. But, before we get to that, can we please give a tip of the hat to the creative approach regarding the naming of the submissions: first up is “Murf and Turf” – a terrifyingly large West Coast triple barrel foam monster surfed by Dale Staples and filmed by his lady, Murfy Murdoch. Then we’ve got “Phil’osophy” – a macking Dungeons barrel ridden by Phil Nel and photographed by Ant ‘Foxy’ Fox. Josh Redman features as the “Grey Gorilla” and then the “Green Gorilla” almost like a superhero who can’t make his mind up. He definitely flies out of two very sick and well-negotiated tubes, that’s for sure. Later on, we see “Compression Session” which, you can imagine, is one helluva beating. Twiggy Baker soundly won the July edition with not one but two angles filmed of his winning wave surfed somewhere on the desolate Western Seaboard of South Africa. Jake Kolnik navigated his way into, down and then underneath a giant Dungeons macker to come out on top of a sweet chiropractor bill and a case of Horse, some Bos and lekker Hurricane apparel for his efforts. August was a Doozy. The judges (allegedly) lost sleep, tore out what little hair they had left, shouted at the dog, and even fell on many more takeoffs than usual. Watching the countries best surfers tearing up their respective regions best waves is a tough job, but someone has to do it. Anyway, it was Wayde Simkiss that got very (very) pitted and waltzed away with his slot in the final, beers and Bos ice tea for days and an arsenal of leashes, grips and equipment from Hurricane Surf. Paul Canning had this to say about the winner; “This month was a super tough decision for me. Two solid waves on that Superbank that turned into S.A’s version of Kirra. In the end, I decided to go with Wayde, just on how that second barrel just rifled off down the line and Wayde really rode it well to come flying out at the end!” True story. On the Beatings front, the judges awarded Ryan Shepperson the win and bragging rights for enduring a solid beating. Then sweet September came a’knocking, the herald of sunshine, then rain, then sun, then wind, then a cocktail of everything in one. At least in Cape Town, it’s like that. It seems to be quite alright up in KZN where last years overall winner, Derek Horlock, smoothly threaded his way through an absolutely gorgeous Southern Coast emerald to take the monthly win and give himself a good shout to go back to back. In what may have been the same session, Brian Wigmore went diving for crayfish and won the beatings award. Peter Horlock filmed both entries, and we hope he’s not getting too much of a boep with all that Striped Horse beer he’s been winning. But if he is, that’s cool, too. So, here we are at the culmination of October. The entries slowed down somewhat, but there is one that stands out like a diamond in the rough. Davey Van Zyl’s smooth surfing and barrel riding acumen looks like a sure thing but let’s wait till the end of the month before we throw a party. In case you didn’t read any of the above, we’ve thoughtfully put together a recap compilation with all the monthly winners (barrels and beatings) to date. 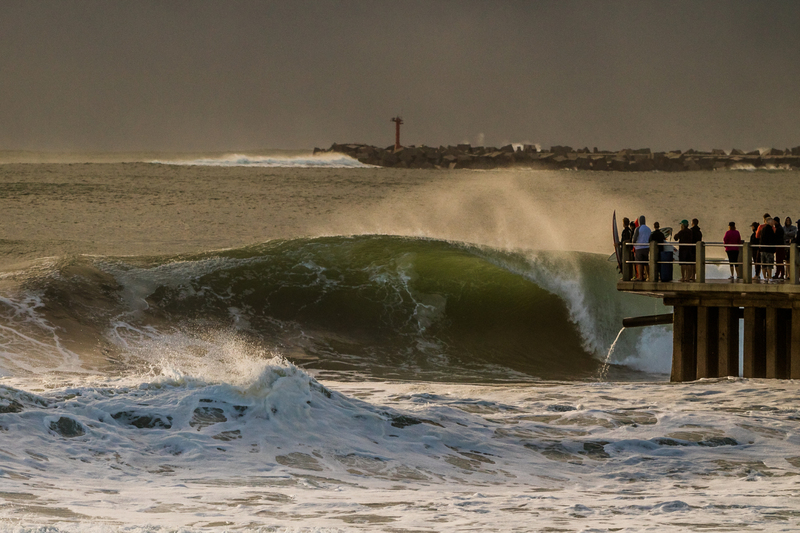 Watch it, get amped, go surf, get tubed, get filmed and then enter the sickest event in SA.